Bridport Open Studios And Floorboards! 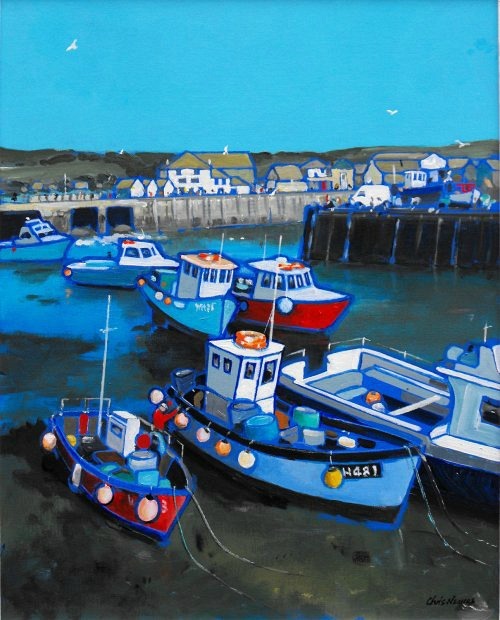 I was lucky enough to spend a West Bay weekend during the Bridport Open Studios event this September. 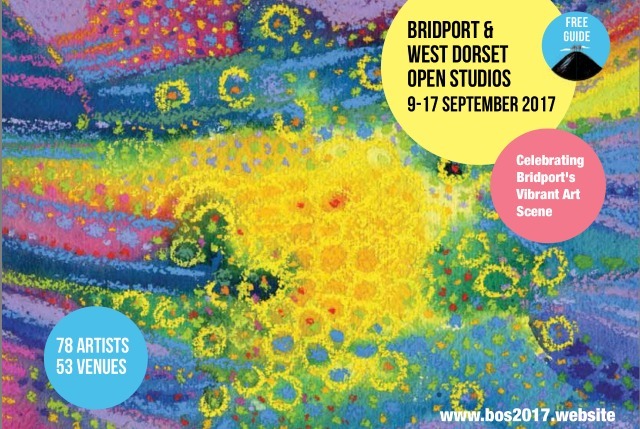 Every year over 75 of West Dorset’s artists, designers and makers open their galleries, studios and homes for people to explore, view and have a chat about their work. There were three Open Studios in West Bay. I’d never realised before that The Old Timberyard, the big old warehouse you can see as you look out of the front bedroom window, houses two artist’s studios on the top and middle floors. It was a pleasure to visit them and see their work inspired by the sea and rocks of the coast here, with the added bonus I could see our cottage out of their windows from a viewpoint I’d never had before! On the middle floor is the huge studio of abstract artist Jon Adam. His pictures were big and stunning but I couldn’t help being sidetracked by his… floorboards! Not something I usually get distracted by but they were the same as the ones upstairs in the cottage, dark and unusually wide. In the studio some of them were very, very long too. I’d always though we had these wide boards due to the ship building history of West Bay, with the same planks used for ship decking too. Jon told me that actually the tree trunks our floorboards are made from were shipped back from America in the eighteenth-century. West Bay, then known as Bridport Harbour, was a busy port with ships setting sail laden with rope and nets to trade. For the return journey large American logs were used as ballast in the ships’ holds in order to remain upright and stable at sea. Upon arrival in England, those same timber cargoes were made into, amongst other things, our floorboards. On the top floor is Amanda Wallwork. Her work is concerned with the archeology and geology of the South West landscape. Her richly coloured and rocky paintings are constructed from layers of plaster and oil paint. 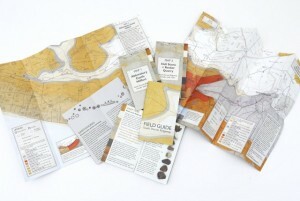 She’s also created charts of the barrows of the Dorset landscape, reimagining them as constellation maps. Most recently she has produced a Field Guide and two maps (more to come) exploring the landscape of the South Dorset Ridgeway. The concept behind these is to highlight how the rocks below the surface influences the landscape we see today. The Field Guide gives an introduction to the landscape and some of the things to look out for, with the two maps show walking routes in the Abbotsbury and Portesham area. There’s now a set in the cottage cupboard. Unfortunately my budget wouldn’t stretch to an original painting but I did treat the cottage to a print of the harbour. Very appropriate I think. The artist is Chris Neaves and he has a little gallery in Bridport on Gundry Lane called Cloud 9 Studio. I’ve given it a frame and it’s now waiting to return home to West Bay.